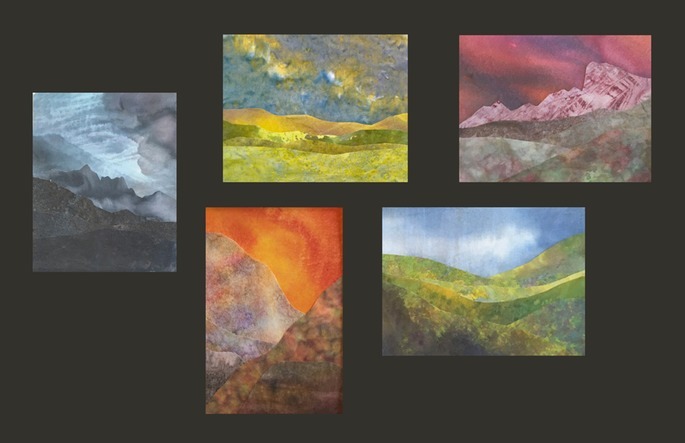 This is how I started out with my fabric landscapes. I made a lot of really tiny artworks. I still do. Yes, they sell, since they are less expensive to buy, they don't require much wall space and there are usually more to choose from. They are also the best way for an artist to let go. I mean that in several ways. First off, in my early days as an artist, working small helped me learn to let go of the artworks themselves. Creating all these tiny works made it hard to get attached to any one piece. I moved on, wanting to try another, and another and another. I believe this kind of approach builds compositional skill and imagination at a much more rapid rate than focusing on one large piece for a long time. Furthermore, making small works requires a lot less paint and fabric. I really just use scraps, something I have hoards and hoards of, so I am not worrying about using up my supplies. It frees up my mind. I am not afraid to try something new or ditch something if it isn't working. Here are several I've been working on this week. These are all 8 x 10 inches or smaller. The layers are not yet secured, so I may still change my mind about them - change out some layers or toss all the layers back into my fabric bins. I use to give every single artwork I made a name, even the 2 x 3 in. sizes. My brother once asked me how I could come up with all these names. It took a lot of time and I bet I've accidentally used the same name more than once. Now the little ones are given 'names' like Sm 232, Mini 304. I have no idea how many of these tiny works I've made and sold (or given away) over the years. Too many to count. I keep pretty good records (and I've gotten better at that now) but it became quite difficult to keep track of them all, and to come up with new names.